Reverend Ted Wiard along with his wife, Marcella, created Golden Willow from a combined vision of compassion and healing towards all life. 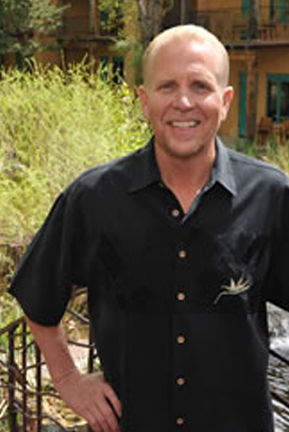 Ted is a licensed clinical therapist, certified grief counselor, an ordained minister, a New Mexico certified schoolteacher and a certified tennis professional. Ted’s passion for working with grief, loss, and recovery arose from his own personal losses in which he realized there were very few places to go for support and healing from loss. Working at Betty Ford Center, Ted counseled individuals and families with clinical and spiritual support through the recovery process. He has written numerous articles on the subject of emotional healing, grief, loss and the connection vs. disconnection of spirituality in loss, addiction and relapse prevention. Ted has co-authored the book “Witnessing Ted, The Journey to Potential Though Grief & Loss”, a sensitive guide on the six aspects of grief and the journey to a wiser more authentic life. He is sought out for speaking engagements nationally to offer his inspirational and dynamic message of hope and healing.